The Medicines Control Council (MCC) took 20 months to respond to an urgent Cipla-Medpro application to include vital new safety information in their generic antimalarial tablet Mefliam packaging, forcing the drug company to go ahead regardless. Now a middle-aged KwaZulu-Natal couple are suing Cipla for over R1 million after allegedly suffering years of anxiety, insomnia, depression and income loss  which they claim is a result of taking Mefliam with inadequate package warnings. The aggrieved couple also laid criminal complaints accusing Cipla of trading without a valid drug registration certificate and failing to include appropriate and timely health packaging warnings. At the time of writing the Commercial Crimes Unit was probing this. However, Superintendent Kallie Lourens, of the Commercial Crimes Unit in Cape Town (where the Cipla Medpro headquarters are), said his men would be visiting the MCC in Pretoria to verify Cipla's claims that it registered Mefliam 'by the book'. 'It also seems there are no statutory provisions requiring all the relevant drug package information on the generic drug to match that of the original (ethical) drug but we'll double-check this at the MCC,' he added. MCC Registrar, Ms Mandisa Hela told Izindaba (after conducting her own probe) that she was 'satisfied there were no irregularities with the registration'. However, it emerged from documentation that the MCC took 20 months to respond to the Cipla application to amend their Mefliam package insert to reflect additional information. This included psychiatric disorders under the headings 'contraindications, warnings, side-effects and special precautions'. Cipla Medpro said their request for a new package insert was made in October 2002, after the company was alerted to a Medinfo press release entitled 'Suicide alert issued on malaria drug'. This press release prompted Cipla to consult the Federal Drug Administration (FDA) website that contained an updated mefloquine package insert. It also asked Cipla to respond to this recommendation 'within six months' and when Cipla failed to do so, sent a reminder on 23 October last year. 'We're still checking to see whether there was a response or not,' Hela told Izindaba on 29 April this year. Dr Nic de Jongh, Medical Director of Cipla Medpro, said the original MCC request to amend was 'done in the public interest' by way of sending the MCC a newly drafted package insert. In spite of the ensuing nearly 2-year delay (the MCC eventually sent them back the wrong insert) his company had gone ahead and included the new packaging information in all Mefliam boxes from December 2002. 'Due to the severity of the warnings, we had no doubt at the time that it was our responsibility to warn patients of these potentially serious adverse effects,' he wrote in a January 2009 letter to the MCC. She did not explain why it took the MCC so long to process Cipla's request. De Jongh said the drug's actual registration was a 'matter of public record in the government gazette', adding that it was 'up to the court to decide' on the legitimacy of the civil claim. 'Our version of the facts is quite simple. There was an FDA warning about suicide risk which we updated (on the package insert) with any new side-effects about the time the complainants came with their insomnia claims. Their symptoms were included in the update when we got the FDA alert' he said. In the claim before the High Court in Durban, insurance broker Paul Kotze (48) and his wife Sharon (47), of Kloof, said they took Mefliam before, during and after a Mozambique holiday in June and July of 2002. Soon after arriving at their destination, Marangula Cottages, they and their two sons, Kelvin (then 13) and Christopher (11) began suffering from insomnia. After a 'nightmare' trip back home their GP's locum advised them to complete the Mefliam course but added sleeping tablets and some vitamin B injections to address the symptoms. A fortnight later their own GP put Sharon, who was by then suffering 'insomnia-related anxiety attacks, intense fatigue and headaches', onto Doxyhexal, another antimalarial. Her husband also suffered from insomnia, high temperatures and headaches, even though malaria and other probable causes were eliminated. After 2 months of sleeping tablets having 'little effect', Paul Kotze had lost weight while Sharon began suffering blurred vision, slurred speech and suicidal ideation by October that year (as a result of sleep deprivation), and was put on antidepressants. The couple, who said they ran marathons, swam competitively and lived a highly sociable life before the holiday, began to withdraw socially. They described themselves to concerned friends as 'zombies'. 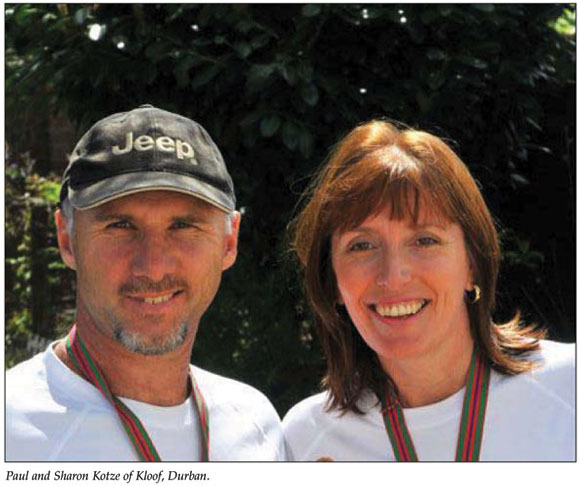 The Kotzes described themselves as financially independent with no abnormal stresses or pressures before their ordeal began, neither having ever suffered from any form of depression, sleeping well to awake around 4am daily when they would usually go for a run or cycle. By January 2003 Sharon had resigned from her three mornings a week half-day job and was suffering from 'chronic sleep deprivation, forgetfulness, impaired vision, pins and needles around her head and down the back of her shoulders and ongoing slurred speech plus loss of libido'. Her husband continued to suffer 'ringing ears, blurred vision, short-term memory loss, loss of libido, chronic fatigue, depression and anxiety', all symptoms she shared. Sharon then got in touch with de Jongh, who promised input from other specialists, saying he would get back to them. This gave them 'short-lived hope, but no solution'. They said a specialist physician and a psychiatrist were unsure of how to treat/solve their conditions, outside of continuing to take sleeping tablets and antidepressants. The Kotzes complained to the company about the lack of 'appropriate' warnings on the Mefliam package insert, contending that insomnia and other side-effects should have been included. De Jongh told Izindaba that he had tried to help Sharon when she contacted him when she was struggling with her dependence on sleeping tablets, but later they claimed that the only reason that he helped them was because of their impending court action. He said that 'this is a crusade' and that the Kotzes would explore every possible avenue to gain leverage. According to court documents, Sharon underwent a polysomnogram in July 2005 which confirmed extremely low levels of sleep. Her husband allegedly only began sleeping lightly after 3.5 years. The Kotzes claim there were no warnings about suicidal ideation, sleep disorders, insomnia and the potential dangers to pregnant women on the package insert at the time, but that these were hastily added in December 2002. They discovered months later that the package insert for Lariam (the ethical equivalent and dated 17 January 1997) included warnings of insomnia and sleep disorders as well as flagging 'toxic encephalopathy of unknown etiology during prophylaxis'. Lariam warned users that the most frequently reported side-effects were nausea and sleep disorders (insomnia, abnormal dreams). Mefliam, however, in their original package insert (August 1997), allegedly had no such warnings. In their 'particulars of claim', the Kotzes also say the company failed to take 'any or adequate steps' to warn users that once they experienced such adverse effects, they should desist from continuing to use the tablets. In their initial filing of court papers, Paul Kotze claims to have lost R420 000 and his wife R378 000 in income over 3.5 years, R5 040 000 and R42 000 in medical and/or hospital expenses respectively, and R180 000 and R240 000 respectively in diminution of the enjoyment of the amenities of life, including the listed adverse effects.  Lariam was developed by the United States military during the Vietnam War when ground troops displayed resistance to the standard chloroquine then in use. Side-effects listed on its label include adverse heart, kidney, liver, skin, central and peripheral nervous system and psychiatric problems.  In 2003, the British Medical Journal published research by Swiss scientists comparing Lariam to three other antimalarial drugs. They found that 41.6% of the patients taking Lariam experienced moderate to severe neuropsychiatric side-effects, almost twice as many as those taking doxycycline or Malarone.  In a rare move in July 2003, the United States Food and Drug Administration (FDA) ordered that patients be warned directly of serious mental problems and reports of suicide linked to Lariam, ordering doctors to hand patients a 'medication guide' with the new Lariam warnings.  A mefloquine neurotoxicity literature review1 reveals that mefloquine neurotoxicity has been demonstrated at both the preclinical and clinical levels, with nausea, dizziness, sleep disturbances, anxiety and psychosis, among other adverse neuropsychiatric events reported in users. Females and individuals of low body mass index are at apparent greater risk.  The Kotze civil claim is set down for 27 July in the Durban High Court.